Budget skin care is something I haven't explored often enough the past few years: I have been using budget cleansers & primers and of course a bunch of sheet masks (although most by Asian drug store brands), but I've not thoroughly ventured into other budget friendly skin care such as clay masks, night creams, scrubs, .. And I really should! Skin care can get quite expensive when shopping in the luxury isle, so a new goal of mine is to incorporate even more drugstore brands into my daily routines so I can save more money for future travels, for example. 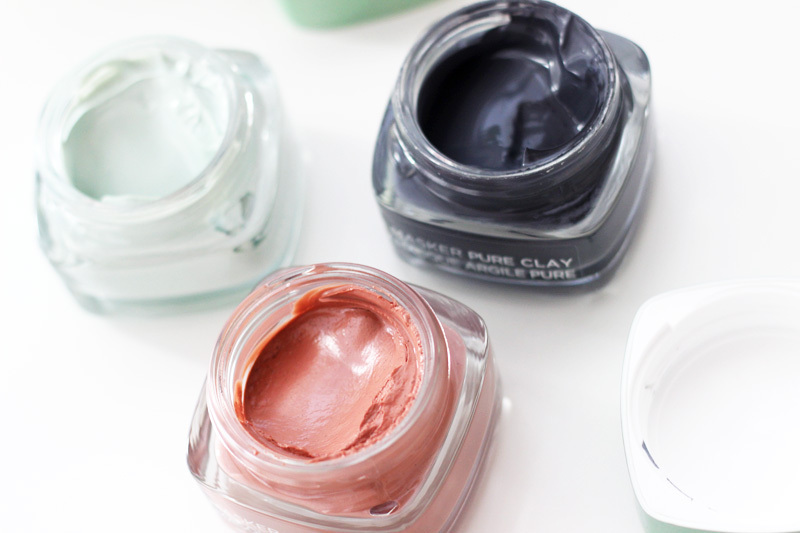 I have really been enjoying the face mask craze in 2016, so I was pretty excited to be able to try out the new L'Oréal Pure Clay masks. There are three of them and I gladly put them to the test. 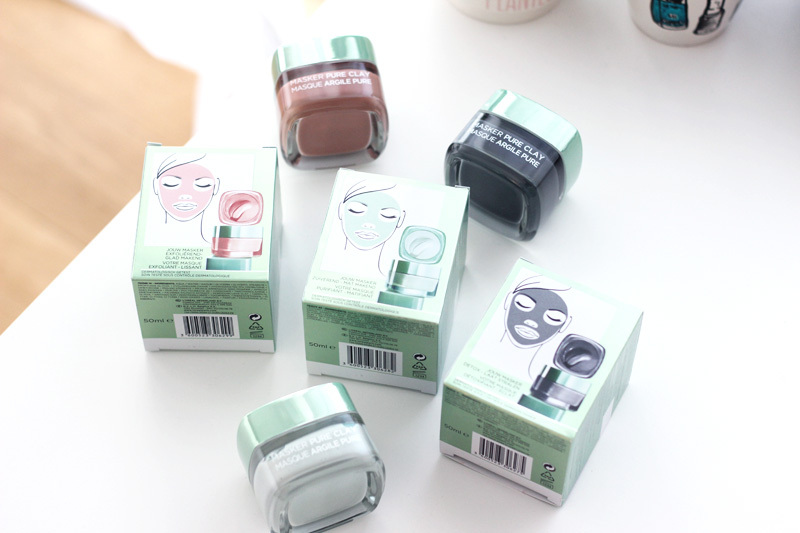 There are three different face masks in the range: the red Glow Mask, the black Detox Mask and the green Purity Mask. 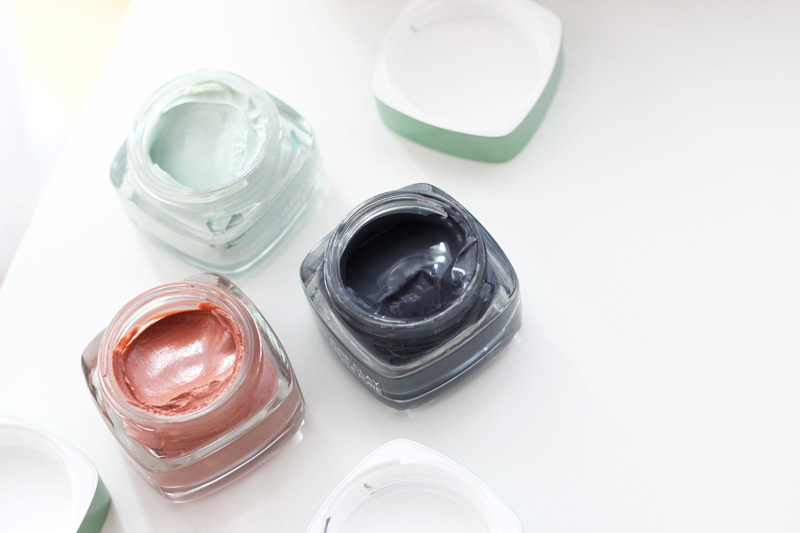 They all have kaolin as a base, further enhanced with Moroccan Ghassoul lava clay & Montmorillonite clay. I noticed that these seem to have different names throughout the region, so just go by colour when shopping in your local store. ↪The red mask is a little different than the other two as it contains considerably less Ghassoul & Montmorillonite clay and contains more glycerin and also dimethicone which the others don't have. 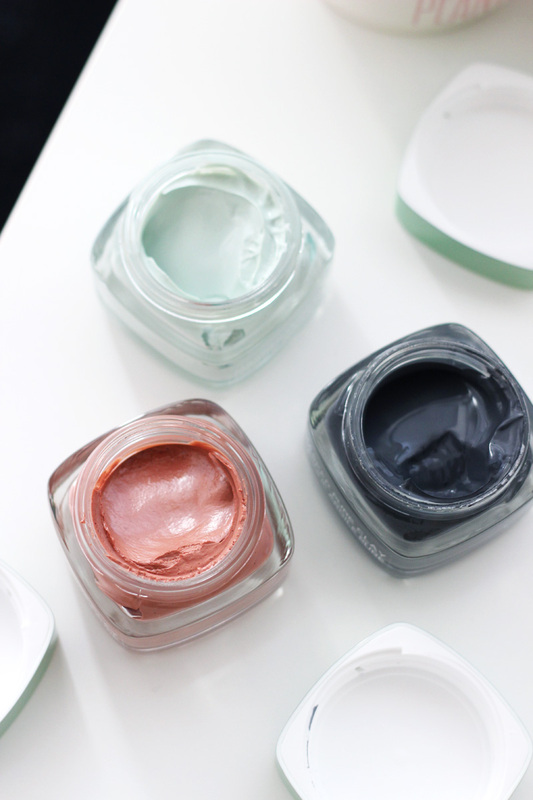 This does also translate into how the masks feel onto the skin: while they all definitely need to be followed up with a good hydrating cream, the red one should feel a little less drying than the others. It also contains a scrub too that you can lightly work into your skin for a light exfoliation, which leaves skin feeling very smooth and looking quite bright too. ↪The black mask is quite hefty and draws out excess oil and tackle clogged pores really well, thanks to the generous amount of clay and the addition of charcoal. Following up with a good moisturising treatment (why not follow up with a moisturising mask?) is a real must! ↪The green mask contains eucalyptus which makes for a tingly feeling, so if you know you're sensitive to eucalyptus or menthol types of additives then you should steer away from this one. All of the masks have a very pleasant fragrance, although it is synthetic which perhaps wasn't very necessary for a face mask. I'm pretty impressed by these budget masks as they are great for absorbing excess oil and smoothing your skin. I like to leave these on my skin for about ten to fifteen minutes max - leaving them on too long will make it a little harder to get them off. The easiest way to wash everything off is to use a warm washcloth and soften up the mud again before removing it with soft washing movements, rinsing your cloth often. I immediately follow up with moisturising treatments, such as another moisturising mask or a good moisturiser. These make my combination skin happy and looking bright, although I do doubt that very sensitive or very dry skin types will love these as much.